If your outdoor interests are piqued by the prospect of hiking a diverse trail system over varied terrain, encountering panoramic vistas, breathing fresh mountain air, splashing in brisk alpine streams, and resting in forests abundant with wildlife, then you have found your outdoor paradise in the mountains and woodlands of Southern Vermont. Yes, Vermont is a wonderful place to hike and explore. Please share your Vermont hikes and comments. To feature your VT business, contact us. 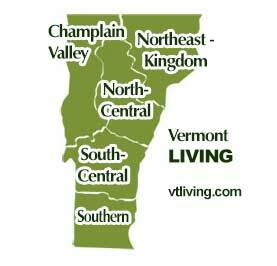 Safe and happy hiking from Vermont Living Magazine. Care is needed to find the trailhead, located in the Chimney Hills development Northwest of Wilmington. From the Wilmington traffic light drive 1.1 miles west on Rt. 9, turn right on Haystack Rd. and at 1.4 miles bear right, continuing to follow the paved Haystack Rd. another 2.35 miles to an intersection. Turn left and follow the sign for Clubhouse and Chimney Hill Rd. At next intersection (2.5 miles) turn right on dirt road – Binney Brook Rd. Bear left at the next three intersections. At 3.5 miles, turn right on Upper Dam Rd. Continue for a short distance on this road to a left turn at 3.6 miles. At 3.8 miles you reach the trailhead, marked on your right with an orange arrow pointing up the trail. The trial follows an old road on easy to moderate grades marked sporadically with blue plastic diamonds to the 0.75 mile mark where it leaves the road and heads to Crystal and Haystack Ponds and the Deerfield Ridge Trail where it climbs more gradually along the ridge. The trail descends to pass between two rock outcrops before the intersection of Haystack Trail, which you follow to the 2.2 mile mark to bear left at another junction which you follow to the wooded summit at 2.4 miles. Your return hike follows the same trails back to the parking area. The trail begins up the Old Rootville Road to a National Forest signboard where it continues past a spur trail and small brook before ascending steeply up the mountain, then levels off through the forest and climbs again with a steep drop-off on the right, before coming to the junction at 1.5 miles with Long Trail. 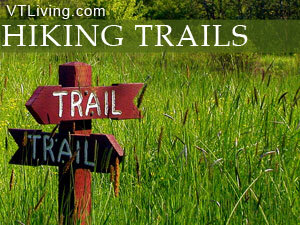 Continue past Long Trail to a spur trail that leads 200 feet West to Prospect Rock. Your return hike follows the same trail back to the parking area. The trial is accessed through the Burr and Burton Seminary parking lot on Seminary Avenue in Manchester Village. The trailhead is located behind the school across the athletic field. This steep and demanding trail begins on an old logging road with a short detour to Lookout Rock with panoramic valley views, and continues up Equinox Mountain, the highest peak in the Taconic Mountain Range offering excellent views of New York State, the Berkshires and the Green Mountains. Your return hike will follow the same trail back to the parking lot. From Townshend follow Route 30 2.0 miles North to the Townshend Dam, turning West across the spillway to a ‘T’ where you turn left and pass the Scott Covered Bridge, to bear right and travel parallel to the West River to the State Park entrance at 1.4 miles. Cross the road to the right of the Park building to campsite #25 where the trailhead is marked with a sign and very large blue blazes. The trail criss-crosses a brook to the 0.6 mile mark where it bears right and ascends over varied terrain up a hillside to the 1680 foot summit at 1.7 miles. From the summit take the blue-blazed trail to the right of the northern overlook, which rapidly descends and bears right at 2.0 miles down a steep hill with occasional views. The downgrade continues to the 3.3 mile mark where it eases leading to campsite #6 of the campground. Follow this road back to the parking area. The trailhead parking area is located on Route 11 midway between Peru and Manchester Center. This trail follows moderately rugged terrain along a portion of the Appalachian National Scenic Trail and Long Trail through the Hapgood State Forest. At 2.5 miles it links to a ski trial leading to panoramic views at the summit. Your return hike can follow the same trail back to the parking area on Route 11, or continue on descending steeply before reaching a spur trail leading to FR 21 on the other side of Bromley Mountain.